The paper describes a simplified model for fluid dynamics based on the Navier-Stokes equations. The fluid is modelled as points in a 2D plane where each point has a density and a velocity. Given an initial density and velocity, the equations calculate a delta to the next density and velocity. The C implementation uses one dimensional arrays to store the points. I decided to try and model the C code as closly as possible in Haskell (and then hopefully contrast it with a purely functional solution). The main data structure is a Grid, instances of which are used to store the density and velocity components. The grid consists of a vector and a size. Just like the C implementation, there's an area of padding around the outside to make calculating the edge cases simpler. Most of the operations involve simply looping over the pixels and doing some calculations. The use of mutable vectors means almost every function is used only for its side-effects. This is really ugly, and I assume that a better Haskell programmer would separate the two more! The following functions remove a bit of boiler-plate from the code. Diffusion models the spread of fluid between each point. Each point will lose density to its neighbours, but also increase by getting density from its own neighbours. For any given cell the net difference will be the sum of fluid leaving via the neighbours minus the amount coming in which leads to the following equation. An iterative technique, Gauss-Seidel relaxation, is used to solve the corresponding equations. 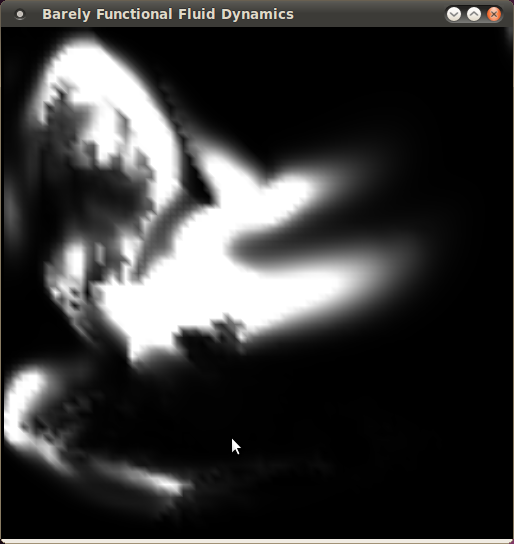 Advection models the changes due to the fluid's bulk motion. Haskell wise it follows a similar pattern as before (loop over each pixel, then write). Projection models the change in velocity. The full code is available on my git hub repository. As always any suggestions on how I can improve this code much appreciated!